The Swan Suburbs women’s side. 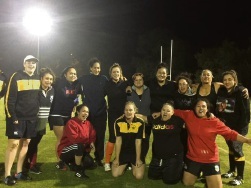 SWAN Suburbs Rugby Union Football Club president Jodie French said they had maintained its women’s side despite pre-season concerns they could fold if unable to attract the players. French said they had more now but numbers fluctuated due to injuries and other reasons and they were always looking for new teammates to join them on their Stratton grounds, including for their men’s side. “We’re halfway through the season now – we’ve just had round 10 –and we finish in two months but we’re always looking for players,” she said. “We’re not at risk of losing our (women’s) team. That being said, we’ve gained some, we’ve lost some. She said while it hadn’t been their strongest year, reporting few wins for both the men and women, there were plans in the works to grow the club and introduce a committee for the juniors. “We’re not winning very many games. The club itself is going really well support-wise and sponsorship-wise and all the good stuff,” she said. “Have we won very many games on either side? No, we’ve won one with our women and one win and one draw with our men. Call Jodie French on 0419 955 271, email swan.suburbs.rugby@gmail.com or visit the Facebook page.